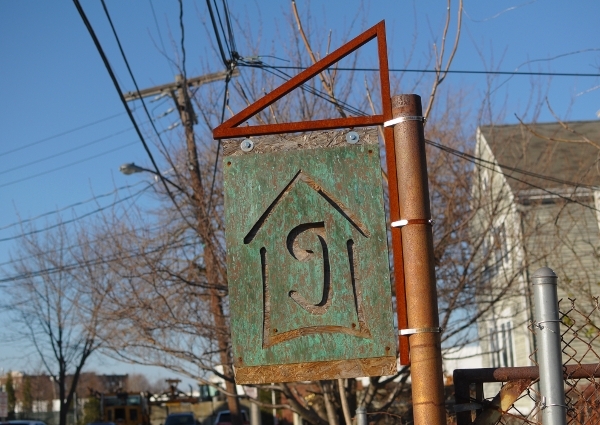 Today I had the pleasure of visiting Geekhouse Bikes in Allston, Mass. A region of greater Boston that's just across the river from Cambridge, Allston is notorious for how dangerous it is to cycle there and I was fully prepared for a journey fraught with peril. Instead, I found myself pedaling along a bike lane followed by a series of quiet streets - at the end of which was Geekhouse, nestled picturesquely between a white picket fence and a rusty chainlink fence, amidst rows of family homes with tidy back yards offset by a sinister-looking warehouse in the distance. When I saw this out front, there was no doubt that I had come to the right place. 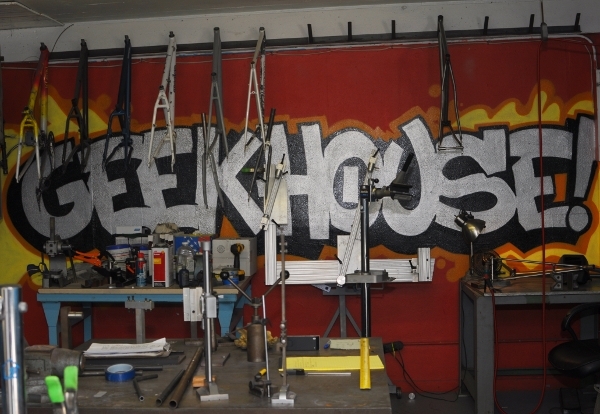 Geekhouse is a small shop that has been producing their distinct custom bikes since 2002. 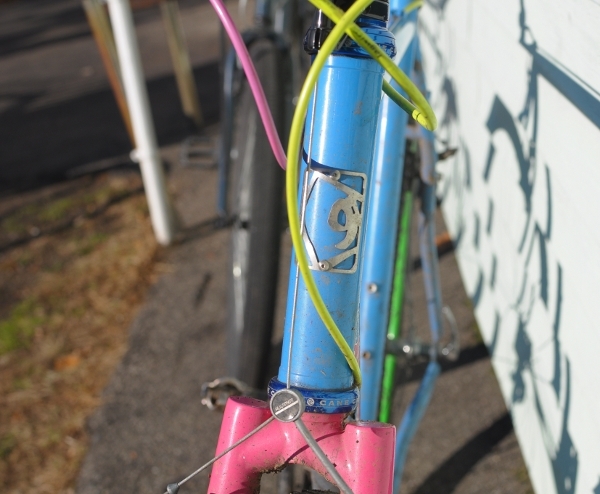 TIG-welded steel, clean lines, and candy-coloured powdercoat, make their handiwork easy to spot on the streets of Boston and beyond. 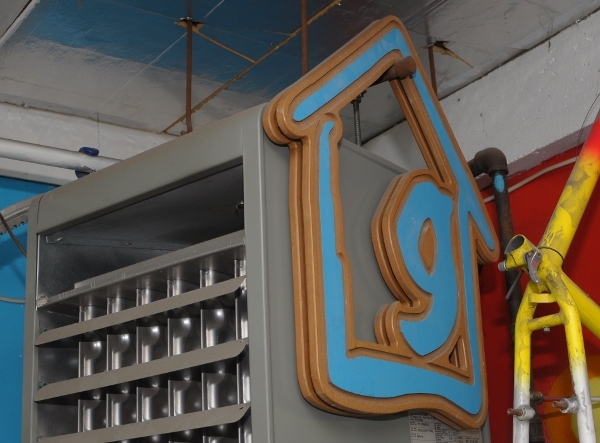 The powdercoat is done in-house by the Geekhouse subsidiary, Sugarcoat. While I generally prefer lugged steel construction, there is something about the "New England bad boy" look of the segmented fork on a neatly TIG-welded frame that makes me feel all funny inside. Now imagine a workshop chalk full of these forks, in candy colours... I did my best to keep calm. 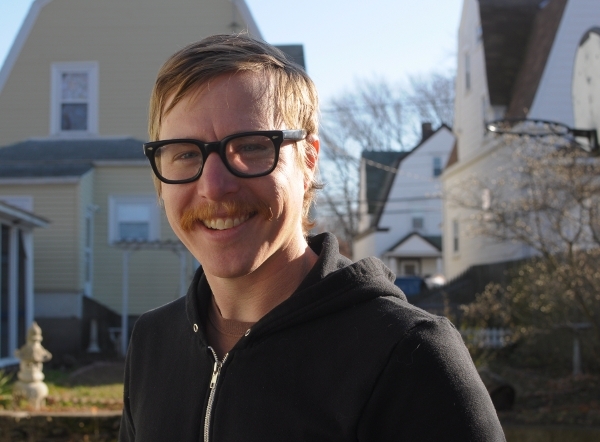 The main man behind Geekhouse is Marty Walsh, who learned TIG-welding while apprenticing for Mike Flanigan of ANT and began making his own frames shortly thereafter. His work embraced the influence of ANT and the Fat Chance legacy, while developing a trademark aesthetic unmistakably his own. and by Gregory in the running-of-the-business department. The sense of comradery between the three boys is endearing, and entertaining to watch. They clearly have a good time working together, which makes for a comfortable and lighthearted atmosphere in the shop. This "Woodville" model is a contemporary take on the loop frame. And notice the "wooden" rims. And a fairly classic straight step-through bicycle re-imagined in Geekhouse style. But of course, a "woman's bike" does not have to be a step-through, especially when it comes to road and touring bikes. 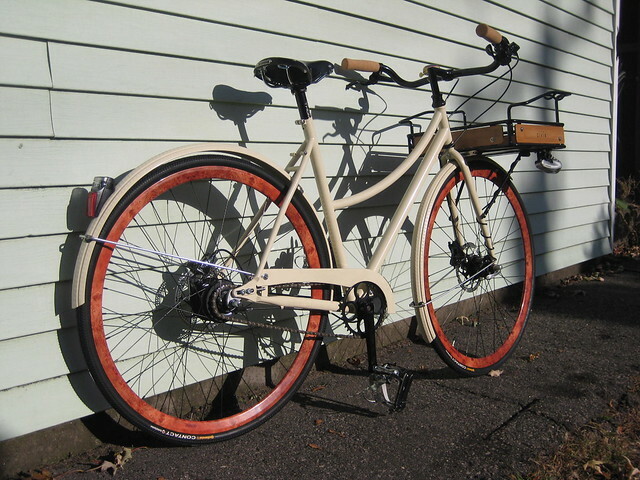 The bicycle above (shown at NAHBS and mentioned here earlier) was made for Bianca, who rode it cross-country for Autism, from Boston to San Francisco. To me this bicycle is just stunning; definitely my favourite Geekhouse bike. And if the owner rode it from Boston to San Francisco, I take it that it has got to be comfortable. What I think makes this a remarkable bicycle, is the combination of all the practical, functional elements - the built-in mounts, the racks, the lights, the sturdy geometry - and the hyper femininity of the colourscheme. The lilac and pale turquoise are unexpectedly gorgeous together. They make the bicycle look very light, almost ethereal. I would not have thought this design up myself, but I love it - and I think it works on a TIG-welded frame better than it would on a lugged one, as combining lugs with such vivid colours would have been overkill. This is also why I think the bright colourschemes of the lugless Brompton work so well, and why I love the TIG-welded truss frame by ANT: Sometimes, just sometimes the clean joints afforded by the lack of lugwork are more fitting to the overall personality of a bicycle. The personality of Geekhouse bikes is certainly distinct, and I look forward to a possible test ride... hopefully something with a delicious segmented fork! Oooh, I love Bianca's bike! Seeing them in natural light makes the bikes much more attractive and more ...organic, somehow. 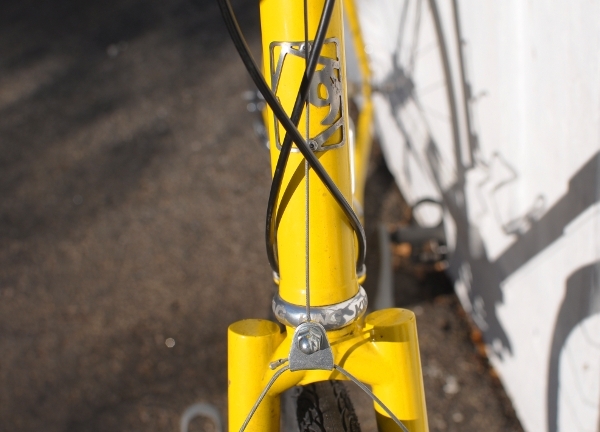 The small-gauge bungee rings on the heavier gauge rack frames attached to Bianca's bike are really harmonious. But the more I think about it, the more I think I understand what attracts me to Geekhouse: it's nostalgia. I am not old enough to feel nostalgia toward lugged frames, but the early mountain bike aesthetic, especially the New England variety, is what was around when I was a teenager. Something about the frames is deeply familiar, and reminds me of the time when I really did "live on my bike," depsite not having been into bikes per se. 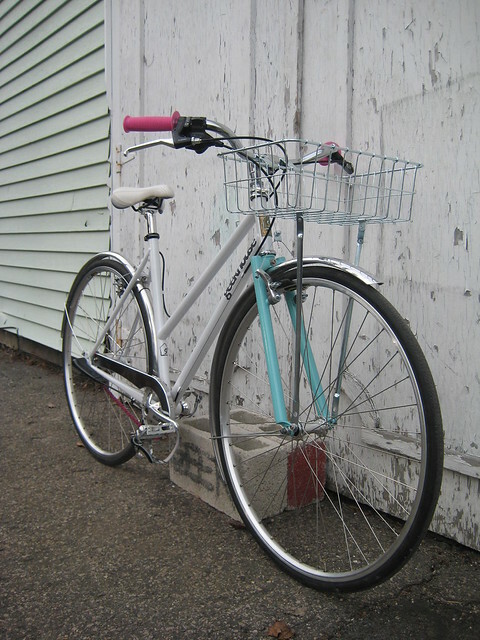 I have a vision right now of a bicycle, a bicycle similar to Bianca's bicycle...it is like they read my mind. Nice. Great post, thanks for sharing Geekhouse with the rest of us. Wow, these bikes look so elegant. Every detail is thought-out. Love the colors, too. I loathe the colours of Bianca's bike...but each to her own! I agree with you about bright colors and tig-welding. Works way better than bright colors and lugs. It looks like those guys have a lot of fun and make people very happy. And it was very interesting to see what they're doing with frames for women. 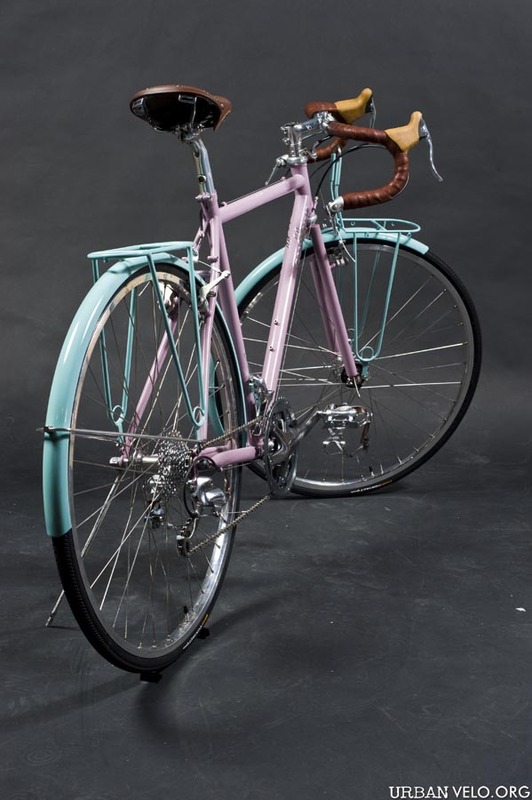 Anon 9:59 - If someone described the bike to me verbally (how would you like a welded lilac roadbike with turquoise fenders? ), I would not have imagined being attracted to it, but I am. The neon-coloured ones are not my cup of tea at all though, especially fitted with the hipster wheels & tires. To each their own indeed. Heck those bikes are beautiful! The only thing I would disagree with it the idea that the Lilac and Turquoise bike should only be for women. Buy it for me and I will be happy to have and use it! I also like the blue one with the funky tires (4th pic). 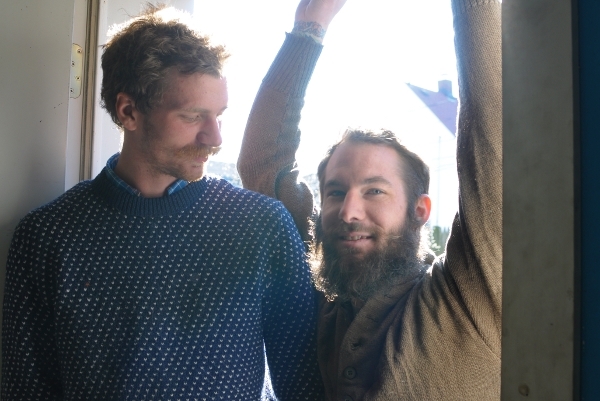 It is great to have these small bicycle builders in business. They appear to love what they do and the product looks damned nice to me. Apart from anything about the bikes, I love "travelogs" and you do great ones, Velouria. Completely agree about the pale lilac/turquoise - would imagine it as twee and dreadful, but it's magically beautiful in the photos. I wonder if it *would* seem twee if those colours were used in a step-through frame, like the gorgeous (rather high - I'd be tripping over it as I do with my mixte!) cream-coloured loop frame "Woodville"? I'd be inclined to think that the non-trad "girls' bike" shape of the bike helps a lot with the colours; the rather severe handlebars and saddle with their dark colours do a lot to make it work, too. Thanks Dave - though does 3 miles from my house qualify as a travelogue? no nick - I also noticed that the loop was as high as a mixte. One advantage of doing that instead of an actual mixte, is to keep the characteristically thick tubing Geekhouse uses on their bikes. I don't think narrow mixte stays would go with their aesthetic. oh man, these are the boys i want to build me a custom frame. i am interested in being a part of the physical building process though. i have been thinking/wanting to take classes but architecture school and working in a firm don't give me the spare time. next time you visit them, take me with you!!!! "I also noticed that the loop was as high as a mixte." This is a trend in mass market cruisers right now as well. Unisex is in. dc - It's neat that both ANT and Geekhouse now offer frame-building classes. I want to learn how to make lugged frames some day, but that won't be realistic for at least a couple more years. kfg - I am speculating here, but I think in the case of the Geekhouse bike the reasoning behind the high joint was so that the bike could be "ridden hard" while still having a somewhat lower step-over height. I could be wrong of course. Though I like the unisex aspect of the designs on Civia and Globe models, I can't say that I find the design elegant. 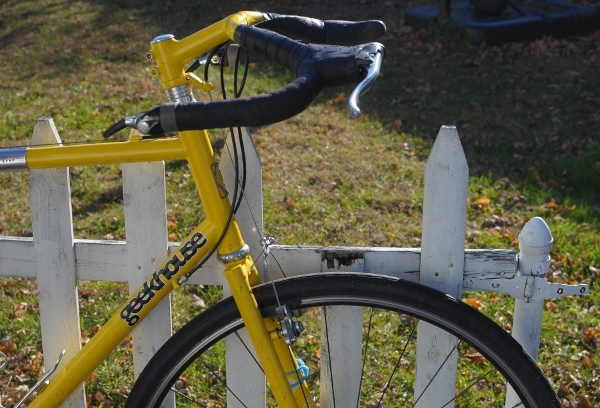 The Geekhouse bike is a little better in that respect - though I still prefer the traditional loop, or mixte. "I can't say that I find the design elegant." I'd have to agree. The cruisers, inherently style over speed bikes, do a bit better, although I sometimes find myself wondering "why bother?" Especially on the ones where the loop is wrong way up. 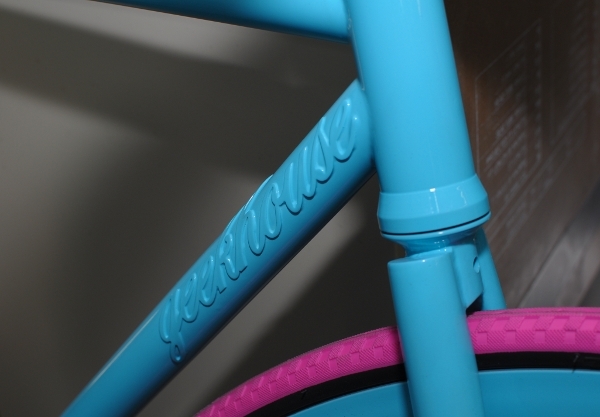 The Geekhouse isn't bad at all, although I have to admit their bikes have never appealed to me and I remember breathing a sigh of relief when they stopped making Melamine partyware, diners and cars in those colorways in the 60s. "...The cruisers... why bother?... Especially on the ones where the loop is wrong way up." I am curious about how that construction even originated. Does anybody know? Geekhouse bikes did not initially appeal to me, because the popular models all seemed to be in neon colours, which just made me think of them as "hipster bait" and I tuned them out. Then I saw Bianca's bike and started paying attention. I began to see past the colours, and noticed that the "bones" of the plain diamond frame bikes were interesting. 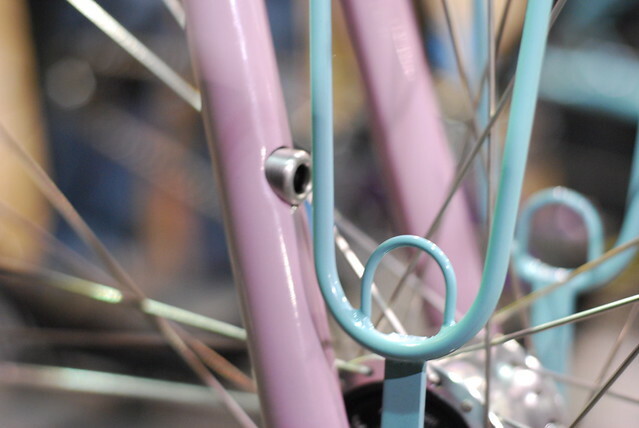 There is a particular harmony in how the segmented fork interacts with the headtube and top&downtube joints. In person this is even more striking than on pictures. It's simple really, the same way as on the Civias. They just moved the top tube seat tube joint down a bit to signal that this wasn't necessarily a "men's" bike and the top tube of a cantilever cruiser has a convex curve. The problem is that you end up with a bike that maybe gives you a few more inches of skirt clearance (on the sort of bike most likely to be ridden in a bikini), but because of the convex curve of the tube gives you little, if any, effective increase in stand over, never mind step through ability. Although I suppose that's what signals the bike isn't necessarily a "girl's" bike. One of the models that has popped up in the past couple of years though has specific lines that put me in mind of doing a small series of customizations, which is exactly what I don't need right now; I'm already hip deep in projects and these could end up being resource intensive. And I'm not careful I'm in danger of becoming something of a collector, rather than merely a hoarder. 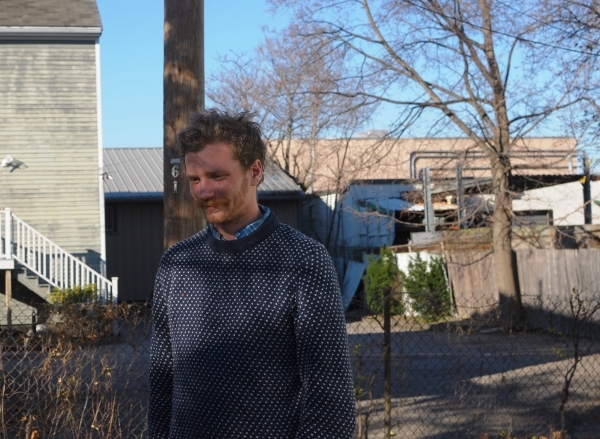 Hey All- Greg here from Geekhouse. 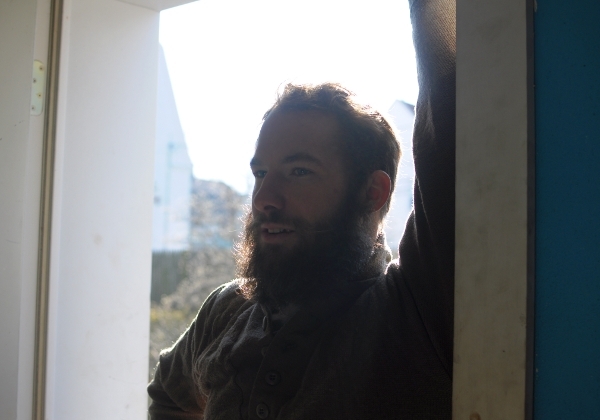 It was lovely to have lovely bike over and I'm excited to see so many comments and such discussion on here. Everything we build is one of a kind and the customers always have more input than we do- Bianca picked her exact color scheme and in fact only a tiny handful of people have let us choose the colors for them (that's where the neon comes in :) If anyone has any other questions, input, ideas.. anything at all- please don't hesitate to drop me a line at greg@geekhousebikes.com. Thanks for all the kind words and another big thanks to Lovely Bicycle!